Not enough talking Katja into a game to high for our bankroll and skill (the $200/400 disaster last Monday) but the very next day I went to our new "friendly" Omaha High Pot Limit game in town. It is played with 500 table stake and 10/20/40 blinds (40 being the usal live straddle) but other than in our Holdem PL game here many players buying in for large amounts, like 3-5k. Also this is not exactly an "easy game" as there are at least 3 full time pros (and I mean online Omaha PL professionals) like Minh, Thang Duc Nguyen (EPT Baden winner) and Paymen. Add strong players like Tony Vardjawand, Katja and highly successful and skilled player Benjamin Kang and you see you’re not exactly in DeadMoneyLand. 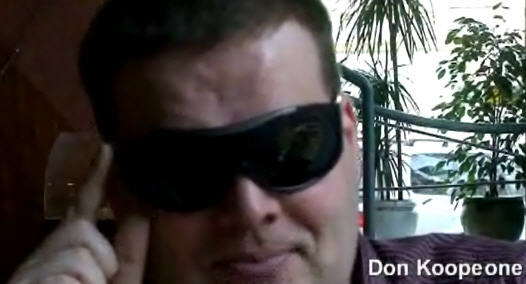 Feeling I still have an edge (lol) I followed the call of "Don Koopeone" who is in every cash game on the planet since his large winning in the Sunday Million and in charge of the live Omaha scene in Hamburg. Right from the start I lost – after a few minutes I flopped top set Aces and lost vs. some ridicoulus draw (backdoor straight, 8 high flush draw) and it went down this way all night – long story short I lost more than 10k euros (Sebastian Luckbox winning more than half of that) and the only reason it was not a few thousand euros more was that I bluffed three players out of a big pot – and each had a better hand! Frank and Kai were all-in, I turned a set of eights on an Js-Ts-Ah-8s board and went all-in into an already large pot: Sebastian folded a set of tens, Jan-Peter Jachtmann folded a straight and Peymen folded a small flush. River was the last ten and I won vs. both all-in players a nice 5k pot. A hand after 10 minutes of play – Omaha sharks, come to Hamburg! 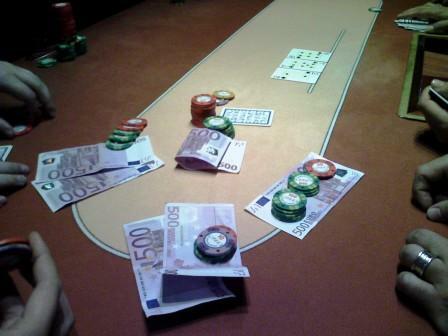 On Wednesday Casino Schenefeld held their first monthly €400 buyin tournament. It was not well known yet so only 26 players showed up but some of those are among the toughest you can find here in North Germany. I busted in about 15th place and was so tired that I left the (smaller) Omaha PL game they had after I won my tournament buyin (lol). While I was sleeping at midnight Katja went on to win the tournament and ease my bankroll pain :D.
Let me pimp my buddies from www.hochgepokert.tv here – they are doing a great job in reporting from WPT Las Vegas!